I’m always on the look-out for different containers for plants. I’ve grown oriental leaves in the wooden crates used to deliver veg to the supermarket, I’ve raised microleaves in the shallow plastic trays used for packaging fruit and veg, I’ve grown herbs in a makeshift vertical garden using an over-the-door shoe-holder, and as an allotment owner, I am well-versed in the art of making raised beds out of pallets. Often these containers are more convenient than conventional pots: round isn’t always the best shape if you’re growing a mix of things in the one pot. Last year our local council gave us wheelie bins to use for throwing out items for recycling, to replace the two 55-litre capacity boxes we’d had previously – one for newspaper and bottles, the other for everything else. 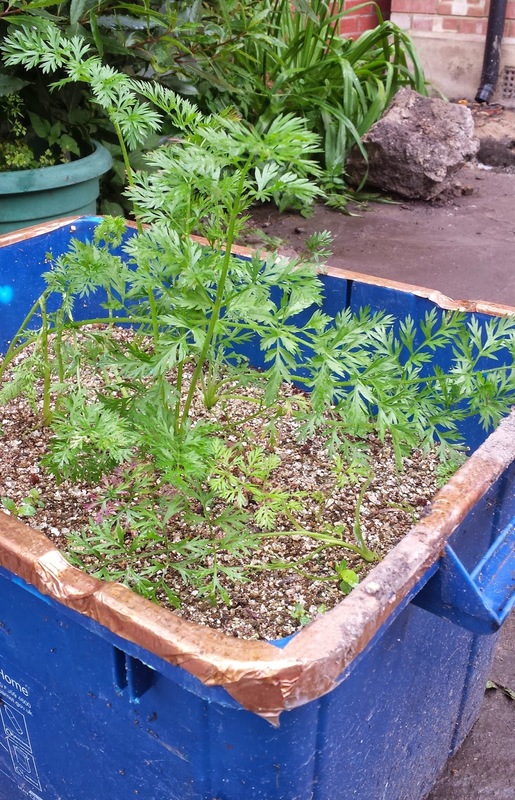 No-one appeared to be responsible for taking away the old boxes, so I collected up the ones in best nick and have found they make excellent seed beds (I started off both leeks and chicory in a recycling box this year), and are particularly good for growing cut-and-come-again salad leaves. With a box kept just outside the back door, I have a variety of leaves available whenever I want them. If some of the plants start to bolt or if they just look straggly, I’ll pick one last harvest, uproot them and sow the next batch. Right now, with the long days and the night temperatures beginning to warm up, they will germinate quickly and give you edible leaves in about four weeks. But you can sow seeds for salad leaves at just about any time of the year. 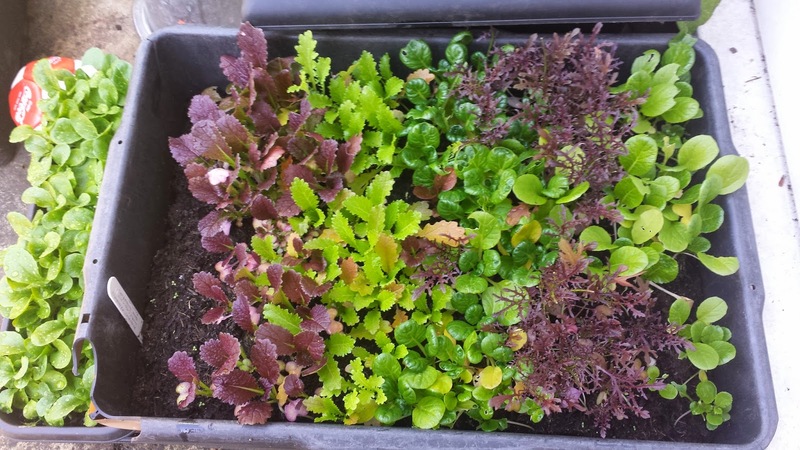 In winter, growth will be much slower and to keep your salad box going you will probably need to protect the box with a cloche or fleece. into seed compost, then covered with vermiculite. To start with you need to source your box. Choose one in reasonably good nick and wash it thoroughly. Next you will need to make some drainage holes in the bottom. Then it needs to be filled with compost. Our recycling boxes are 40cm deep – rather deeper than the salad roots will go down, so rather than waste good compost buried at the bottom of a recycling box, I spread gravel or small pebbles along the bottom, to help with drainage, and then add a layer or two of leaf mould, spent compost or mulch – any good organic matter to fill the box up halfway. Then I top up with fresh seed compost. Before sowing, water the compost thoroughly. Then scatter the seeds thinly on top of the compost – you can mix seeds randomly or sow different varieties in blocks or thin lines, as I have in the photo. Finally sprinkle a very fine layer of seed compost over the surface so the seeds are just covered. At this time of year, you don’t need to cover the box to keep the seeds warm, but if you’re sowing late in the year or in early spring, you can cover with a clear plastic propagator lid if you have one, or with horticultural fleece (I have also improvised with an insulating cover of clingfilm in the past, when I haven’t had either a lid or any fleece to hand). You may also need to protect your salad seedlings against slugs and snails if these are a pest in your garden. I run a strip of copper tape along the rim of the box: the molluscs won’t slide over copper as it reacts with their mucus. My particular pest in recycling box beds is my own cat, who likes to either sleep on them, flattening the seedlings, or, worse, using them as a litter tray. A square of plastic mesh over the top, fixed with net pegs, keeps him off.